Securing the safety of our nation’s aviation system is our industry’s top priority. In order to maintain our standing as the safest air transport system in the world, we rely on a multilayer approach to security, using numerous strategies that all play important roles. One of those critical layers is the Federal Flight Deck Officer (FFDO) program. Since 2003, the FFDO program has been tremendously successful as a strong, ongoing deterrent against hijacking threats. FFDOs are cargo and passenger pilots who volunteer their personal time in order to receive the training required to become deputized FFDOs, and these pilot volunteers pay a portion of the expenses associated with the program. In total, thousands of ALPA pilots flying for cargo and passenger airlines have volunteered their time defending our airspace, securing nearly a million flight segments every year without any personal compensation. The FFDO program is a proven and cost-effective component of transportation security in this country and has often been praised by the Transportation Security Administration (TSA) for the additional layer of protection it brings to air transportation. In the light of recent global security concerns, fiscally responsible programs like FFDO is simply sound policy. The cost to secure the cockpit with an FFDO is approximately $17 per flight; this program is not only good public policy, it makes good economic sense. The program needs to be strengthened, not eliminated. President Obama’s 2015 budget blueprint cut FFDO funding and eliminated TSA staff positions that are critical to maintaining the program. Today’s FFDO program is already at minimal funding levels and unless adequate numbers of pilots are accepted for training on an ongoing basis, the program will shrink and fail. Along with ALPA pilots who continue every day to make many personal sacrifices to protect our nation’s airline passengers, crews, and cargo by serving as FFDOs, our union will continue to lead the fight to ensure this crucial program continues to protect lives and airplanes. Please participate today in ALPA’s latest Call to Action by clicking here. It takes less than two minutes and sends the message to the White House about the importance of protecting funding for this program. Six months after the International Civil Aviation Organization (ICAO) announced its intent to ban the transport of lithium-metal batteries as cargo on passenger flights, the Honourable Lisa Raitt, Minister of Transport, announced a suite of amendments to Canada’s Transport of Dangerous Goods Regulations (TDGR). The updates include a ban on transporting lithium-metal batteries as cargo on passenger flights in Canada, effective January 1, 2015. Most Canadian carriers have already voluntarily banned the carrying of these batteries as a safety precaution. The United States has banned the carrying of lithium batteries as cargo on passenger planes since 2004, and it was in July 2014 that ICAO finally adopted a worldwide standard on the issue. This action supports ALPA’s ongoing effort to strengthen ICAO provisions for the carriage of lithium batteries as cargo by cargo airlines. By instituting the ban in accordance with ICAO standards, Canada and others in industry and government have recognized the risks associated with carrying lithium batteries as cargo. The logical next step for ICAO, Canada, and the United States is the development of special packaging and carriage limitations for all-cargo aircraft as well. The ban applies to carrying lithium batteries as cargo only. Passengers and flight crews will still be able to bring personal devices that use lithium-ion batteries onboard. ALPA President, Captain Lee Moak testified today before the U.S. House Aviation Subcommittee on Unmanned Aircraft Systems (UAS) safe integration into the National Airspace System (NAS). With a number of recent news reports highlighting “near miss” incidents between airliners and UAS’s, public attention is rightly on the safety of remotely piloted aircraft (RPA) and how to safely integrate them into the NAS. Today Congress reviewed the integration, oversight and competitiveness issues related to UAS in advance of the September 2015 deadline for the FAA’s plan for UAS integration. Watch the webcast here. Captain Moak stated during his testimony that ALPA does not oppose the safe integration of UAS into shared airspace. We recognize the economic value and innovation presented by UAS. However, it must be reiterated that UAS are aircraft. When and if they fly in the national airspace, they must be subject to the same rules and regulations as other airspace users. Finally, the FAA needs a solid funding stream to continue to produce the regulations that will guide integration of UAS into the NAS. These points were well received by the Members of Congress in attendance who heard from Captain Moak about what actually happens while operating in the NAS. ALPA will continue to serve as a resource for policy makers in the coming years as rules and regulations are developed to keep the skies safe while allowing the UAS industry to grow. For additional reading on ALPA’s position on UAS’s, please read our white paper by clicking here. More than 100 aviation workers, including pilots from 14 ALPA member airlines, hit Capitol Hill Wednesday as part of ALPA’s Day of Action, urging members of Congress to continue sending the U.S. Department of Transportation a loud and clear message to deny NAI’s foreign air carrier permit application. The group met directly with numerous Members of Congress and visited all 535 House and Senate offices to stress the urgency to safeguard the U.S. aviation industry against NAI’s flag-of-convenience business model. Day of Action to #DenyNAI: Your Participation Is Needed! Tomorrow, Wednesday, November 19, pilots, flight attendants, and other aviation professionals will descend on Washington, D.C., to tell Congress that we will not allow our jobs to be exported thanks to the anti-labor practices of Norwegian Air International. 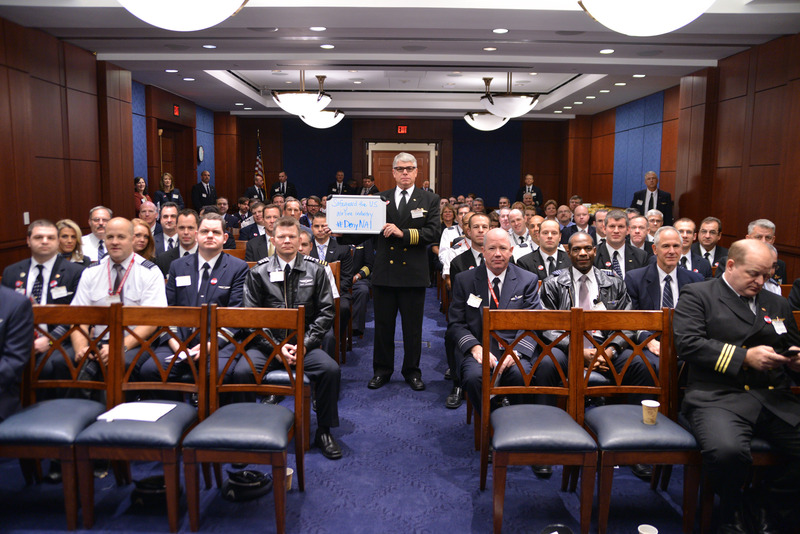 ALPA pilots understand the threat that NAI poses to our collective futures, and we are proud of the many pilot volunteers who will walk the corridors of Capitol Hill and meet face-to-face with lawmakers for this important event. Can’t attend? There’s still a way you can participate and express your concerns about NAI to Congress. Be a part of #FinishTheJob by using Twitter to help federal legislators understand why they must act now. Click here and follow the five simple steps to participate. We’ll retweet everyone’s messages on Wednesday, so please be sure to post yours then. If you don’t have a Twitter account, complete the first four steps of the process and e-mail your photos to Communications@alpa.org. Also, be sure to join ALPA’s Call to Action to encourage members of the House of Representatives to sign a bipartisan letter calling on the Department of Transportation to deny NAI. Even if you have previously participated in the NAI Call to Action, you can still take part in this campaign to encourage your elected official to sign the letter. Our hard work in convincing members of Congress to #denyNAI paid off when DOT dismissed NAI’s initial exemption permit, but that was just the first step. We must keep the pressure on to ensure that DOT rejects NAI’s formal foreign air carrier permit application, once and for all! The CEO of Norwegian is slated to speak at a Washington, D.C., luncheon on November 20, and the following week, the European Commission has requested an “urgent meeting” with U.S. officials to discuss NAI’s pending application. The timing of this fly-in and social media effort could not be more crucial. Hold our decision makers in Washington accountable! Join us for the Day of Action—in person or online—and help us communicate that we can’t allow NAI to bring its illegal, job-killing scheme to our shores. As the threat of high powered lasers being pointed at airliners during critical phases of flight continue to be a threat to aviation safety, ALPA and the FBI continue to partner in a campaign to raise awareness about the dangers of lasers. So far the campaign seems to be successful in the New York City area with the number of incidents dropping overall in New York airspace. ALPA pilot Captain Robert Hamilton (PSA) highlighted to a CBS news affiliate the danger of a laser beam penetrating an aircraft cockpit and the effect that a laser beam can have on the pilot’s short and long term vision. This growing threat aviation safety and pilot’s’ health spurred ALPA and the FBI to team up to work at the local level to deter and combat those who would knowingly or unknowingly endanger public safety. The campaign works with FBI field offices in major metropolitan areas to educate the public about the safety risk and consequences of pointing a laser at an aircraft. FBI officers are also staffed on the ground in high risk areas ready to mobilize immediately after an incident is reported. When the campaign started in June there was an immediate drop off in the number of laser incident throughout the country. As part of the FAA Modernization and Reform Act of 2012, shining a laser at an airplane became a federal offence that is punishable by up to five years in jail and a fine of $11,000. ALPA was successful in pushing for this change as part of the Act that was signed into law two years ago. Similar efforts are underway in Canada where recently a laser incident illuminated the cockpit of a WestJet flight. Under Canada’s Aeronautics Act, it is a criminal offense to interfere with the safety of an aircraft. If convicted, offenders face a maximum $100,000 fine, five years in prison or both. However, actively shining a laser at an aircraft is not specifically a criminal offense – yet. ALPA has joined with other stakeholders to urge Canadian Justice and Transport Ministries to stiffen penalties and to work together on a campaign to reduce laser strikes on aircraft. Hear ALPA Canada Board Chairman Dan Adamus’ recent interview highlighting the need for more attention on this growing threat. For more information on ALPA’s efforts to keep pilots safe from lasers, click here.